As our pals at sister site ClickHole know, picking a lunch spot can be an endless quest. No one wants to make a firm choice, and everyone ultimately ends up unsatisfied. 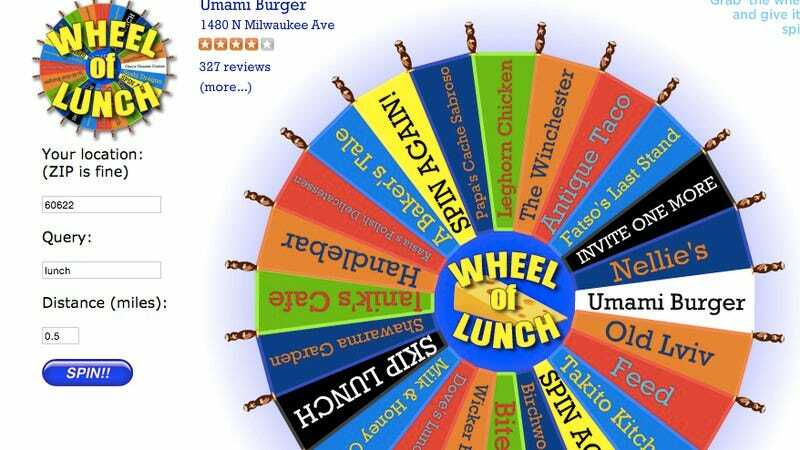 Fortunately, there’s Wheel Of Lunch, a site that uses Yelp and user-generated parameters to take all the wavering out of lunchtime decision-making. Just give the wheel a spin and let it dictate where you’ll eat today, be it the nearby steakhouse you can’t afford or the gas station around the corner that probably has some sort of food product for sale. Of course, as the Wheel Of Lunch disclaimer clearly states, “The presence of a dining establishment on the wheel in no way constitutes an endorsement of said establishment,” noting, “This is particularly true of Der Weinerschnitzel.” Spin at your own stomach’s risk.